Here's an article about the genesis of the theme park special effects industry, tracing it from Yale Gracey and Bill Novey at Disney to the post-Epcot diaspora and formation of such companies as Art & Technology, WET and Technifex. I first wrote it in 1997, and it is now on Blooloop, with some where-are-they-now updates and photos. It is timely in light of Mark Fuller (WET founder and CEO) having recently been named to receive the Thea Award for Lifetime Achievement. 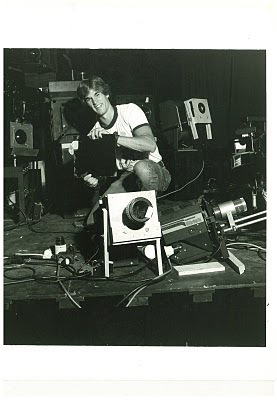 Photo: Young Monte Lunde (later, the founder of Technifex) working on a projector at WED Illusioneering. Courtesy Technifex.